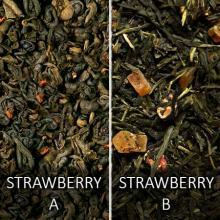 Help us choose our new Strawberry Green Tea! Strawberry A and Strawberry B will be going head-to-head in our Berry-Picking with Discover Teas competition. Enter "Berry Picking" into the Customer Notes section at checkout with any tea purchase and we'll send you a free sample of each one so you can help us decide which to keep! 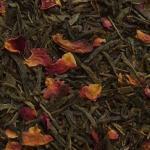 Once you've tried both, e-mail orders@discoverteas.com with your vote and let us know your fave. Each individual purchase of Strawberry A or Strawberry B also counts as a vote, but if you find you've changed your mind, simply e-mail us and we'll be happy to change it. ABOUT STRAWBERRY A: The bright sweetness of real strawberries brings joy to this naturally-flavored Hyson green tea blend. A sip brings smiles whether steeped hot, iced, or cold-brewed! Sold in 2 ounce quantities. 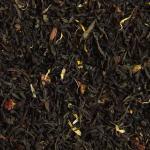 Note: 2oz of tea brews approximately 20-25 8oz cups. ABOUT STRAWBERRY B: Fragrant, full-flavor summer sweet strawberry and papaya pieces round out an exceptionally smooth sencha green tea. A surprisingly sweet cuppa that's all natural! Sold in 2 ounce quantities. Avg. based on 1 customer review(s). I love strawberry. It's such a great flavor and this tea is no different. It has the sweetness and fullness of the fruit flavor that requires very little sweetener. 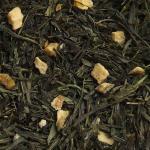 I also like this tea because it's perfect for blending with other flavors to create more complex teas. I recommend blending it with the White Swiss Truffle Rooibos.